Total Studio 2 DELUXE completes your studio with the world’s most balanced selection of instruments, plug-ins, and sounds for today’s musical needs—rock, hip-hop, pop, EDM, classical, jazz, and soundtracks. From the first click on a record button, to the final touches that create a radio-ready master, Total Studio 2 DELUXE delivers what you need for professional-level productions. With a total value of just under $4,000, this expertly curated bundle saves you almost 90% compared to purchasing all instruments and models individually. And as your needs grow, so can your setup—upgrade at any time to Total Studio 2 MAX for the ultimate studio configuration. Total Studio 2 DELUXE’s 35 astonishing products strike the right balance of features, flexibility, variety and power. 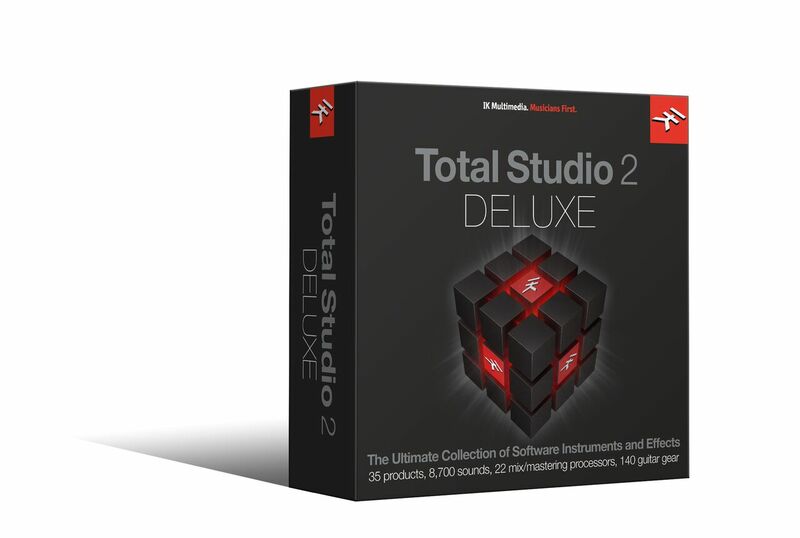 With over 9,700 sounds, 12 powerful virtual instruments, 22 mixing and mastering processors and 140 guitar amps and FX, Total Studio 2 DELUXE lets musicians, composers, and producers maximize their creativity. Whether you’re creating a full orchestral mockup, working on your next record, assembling beats, or producing a video soundtrack, the massive 115 GB sample library is all about instant inspiration. Need an orchestra? The world-class Miroslav Philharmonik 2 suite has over 2,700 instruments that cover the full range of orchestral sounds—including orchestral percussion, cinematic percussion, and the fabulous Brandenburg piano. For cutting-edge sounds and beats, as well as acoustic and electric instruments, SampleTank 3 — the industry-standard sound and groove workstation — makes it easy to find the ideal sound. And Syntronik, which comprises many of the most iconic analog and digital synthesizers ever created, is like having a museum of expertly maintained classic synths. Discover more here about the included software. 140 Guitar FX and Gear Models. AmpliTube 4 Deluxe, the industry-standard tone studio for guitar players,bassists, and producers, offers the finest digital recreations of the most coveted guitar and bass equipment ever manufactured. With an amazing selection of amps, cabs, and effects included — and you can easily add gear from legendary names like MESA/Boogie®, Fender®, Ampeg®, and Orange® — AmpliTube isn’t just a world-class tone studio, but a channel strip plug-in for your favorite recording software that adds character to all kinds of instruments. 22 High-End Mixing and Mastering Processors. Take your projects over the finish line with T-RackS 5 Deluxe—a mixing and mastering modular powerhouse with precision emulations of classic analog studio gear and the latest digital tools. Run the processors as individual plug-ins, as a mix/master chain, or within a stand-alone application for full-blown mixes and masters that bring out the very best in your music. There’s even a complete, broadcast-ready metering suite to insure radio-friendly masters, and support for high-resolution sample rates up to 192 kHz. Minimal: Intel® Core™ 2 Duo, 4 GB of RAM (8 GB suggested), macOS 10.9 or later, 120GB of available hard-disk space. Minimal: Intel® Core™ 2 Duo or AMD Athlon™ 64 X2, 4 GB of RAM (8 GB suggested), Windows® 7, Windows® 8 or Windows® 10, 120GB of available hard-disk space. Requires an ASIO compatible sound card.